During the 1880s rustic beefsteak dinners became a popular form of entertainment among wealthy businessmen who formed beefsteak clubs whose traditions they traced back to England and the early Republic. 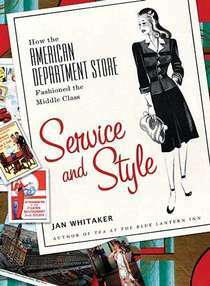 Then, at the dawning of the 20th century, large restaurants and hotels began to create special banquet rooms for these feasts. Known as beefsteak dungeons, dens, caves, or garrets, they hosted groups of men who gathered for a night of boyish fun blissfully free from conventional dining etiquette. 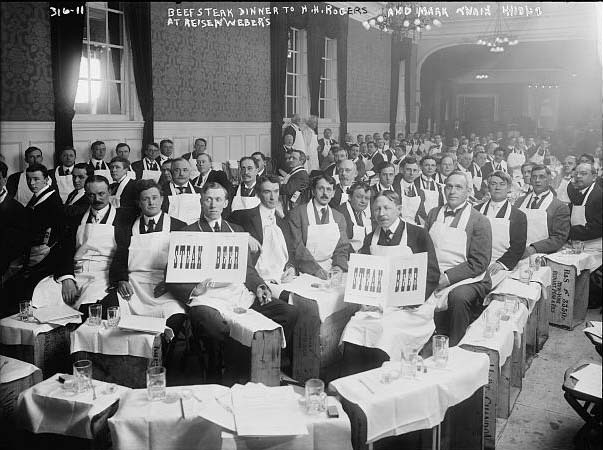 The standard beefsteak dinner at these festivities involved diners donning white butcher’s aprons to eat steaks with their hands while sitting on boxes and barrels in a dark basement contrived to seem menacing. No utensils were furnished, but the thick slices of steak, dipped in melted butter and grilled on a hickory fire, were accompanied by triangles of bread. In the classic version little else was served other than stalks of celery and unlimited mugs of beer (the steaks were unlimited too). However, niceties such as pre-dinner sherry and appetizers did creep in over time, especially on the rare occasions when women were invited. 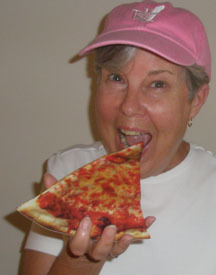 Among the leading venues for “beefsteaks” in New York City were Healy’s, the Castle Cave Grill Room, and Reisenweber’s garret. It was at Reisenweber’s where 150 or so humorists and cartoonists toasted Mark Twain at a beefsteak dinner in 1908. Apparently the size of the group required using an ordinary, civilized banquet room (pictured at top with their opened menus). Theodore Roosevelt was among the celebrities who “ate with his claws” in a dungeon at NYC’s Zangheri’s (pictured), whose basement rooms were rigged up with papier maché stone walls, built-in beer kegs, mugs, and purported murder weapons. Beefsteak dungeons were not only found in New York, but appeared all over the country during the peak fad years before WWI. 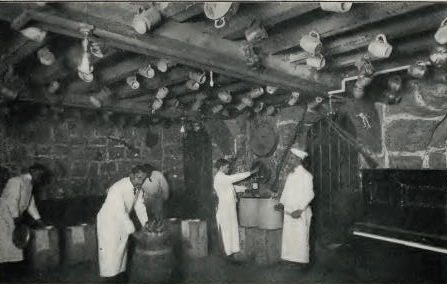 In Cleveland, the beefsteak dungeon in Finley’s Phalansterie attracted a delegation of Congregationalists from Oshkosh, Wisconsin, in 1907. Later they reported, “It was the most unique environment in which we ever took a meal, and although at first the novel surroundings startled us, the experience was thoroughly enjoyed.” When the Owyhee Hotel opened in Boise, Idaho, in 1910 it was furnished with a dungeon ready to host its first guests who turned out to be a group of ministers. 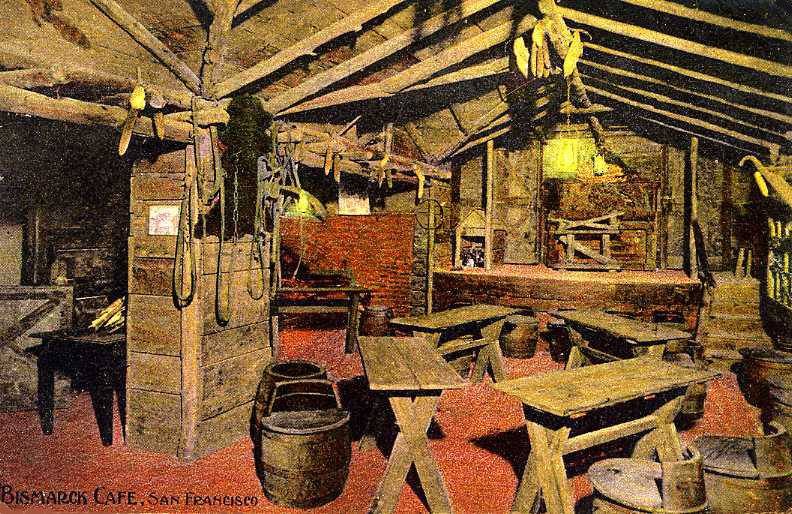 San Francisco had barn-like beefsteak dens about this same time, such as at the Hof Brau and the Bismarck Café (pictured). 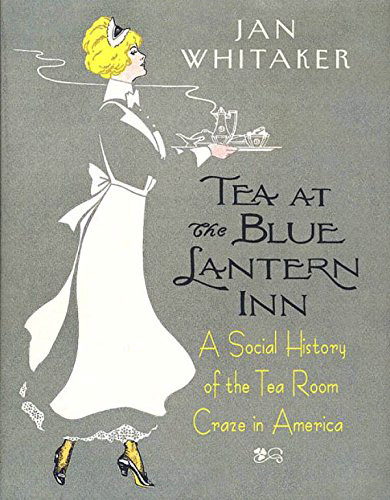 As popular as beefsteak dinners were with male college students, fraternal organizations, sports teams, and conventioneers, their appeal dimmed during the war and Prohibition and never fully returned. I can’t help but wonder if the memory of the churchmen’s trip to Cleveland in 1907 somehow explains why Oshkosh was one of the few cities which still had a beefsteak dungeon in 1939, in the Teddy George Grill and Taproom.